When we look at buildings, what do we see first? What attracts us most? What grabs our attention? Last month, we began a pilot study exploring these questions at Boston’s Institute of Human Centered Design (IHCD) using an off-the-shelf ‘eye-tracker’ combined with data analysis software. Eye tracking technology lets you see how people look at their world and records where they unconsciously focus. Product designers and marketers already use this and other bio-sensing or monitoring tools to find out which products consumers will likely buy based on their viewing preferences. 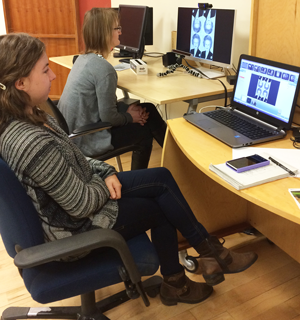 In our preliminary study, more than 30 volunteers looked at over 60 images of the built environment. What would our eyes be naturally drawn to without conscious control? This photo shows the eye-tracking test environment at IHCD. The study volunteer (on the left) views photos on her monitor while an IHCD staff member watches the test computer with eye-tracking analysis software installed. 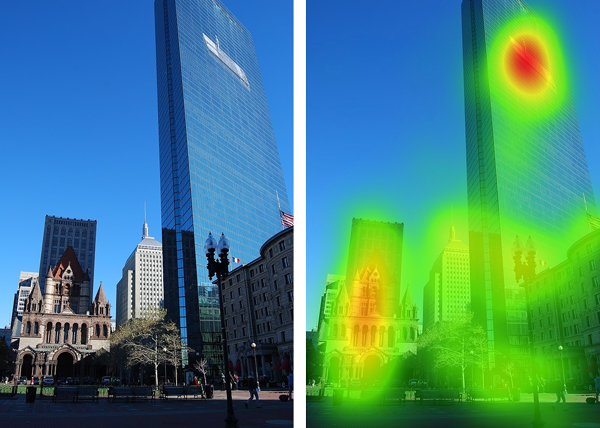 Below are a few of the test results from Copley Place, one of Boston’s famed public spaces. The photos show Trinity Church (1877, by HH Richardson), a famed Romanesque building next to IM Pei’s landmark skyscraper, today called 200 Clarendon (formerly the Hancock Tower) built in 1976. The ‘heat maps’ glow bright red where volunteers looked the most and fade to green where they looked less. Areas of contrast, such as the front elevation of Trinity Church. The following ‘spotlight’ image, in black and white, shows the same thing as the ‘heat map’ with bright areas indicating intensity of interest. 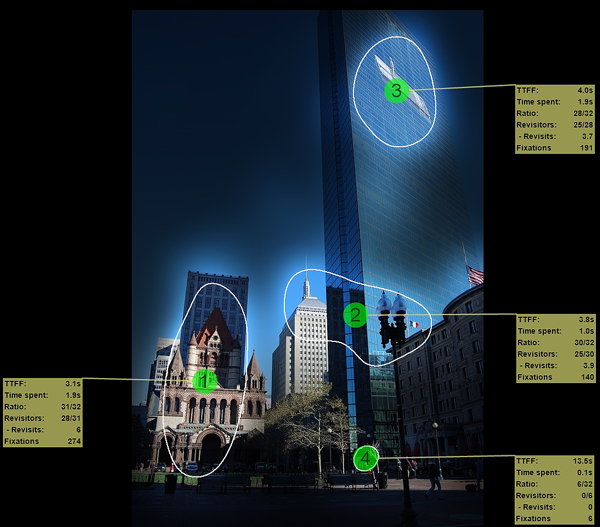 The data term TTFF means Time to First Fixation; it shows how people tended to look at nineteenth century Trinity Church first, and the mid-20th-century Hancock Tower second and third. They then fixated on the tower’s art installation 191 times in the 15-second viewing interval, going back to look at it on average close to four times! Our study’s preliminary conclusion? People love looking at people, not unlike what architect Jan Gehl is famous for saying, quoting 1000-year-old ancient Norse poetry, “Man’s greatest joy is man.” Given that we’re a social species, it does stand to reason. Stay tuned for more data and photos – coming soon! 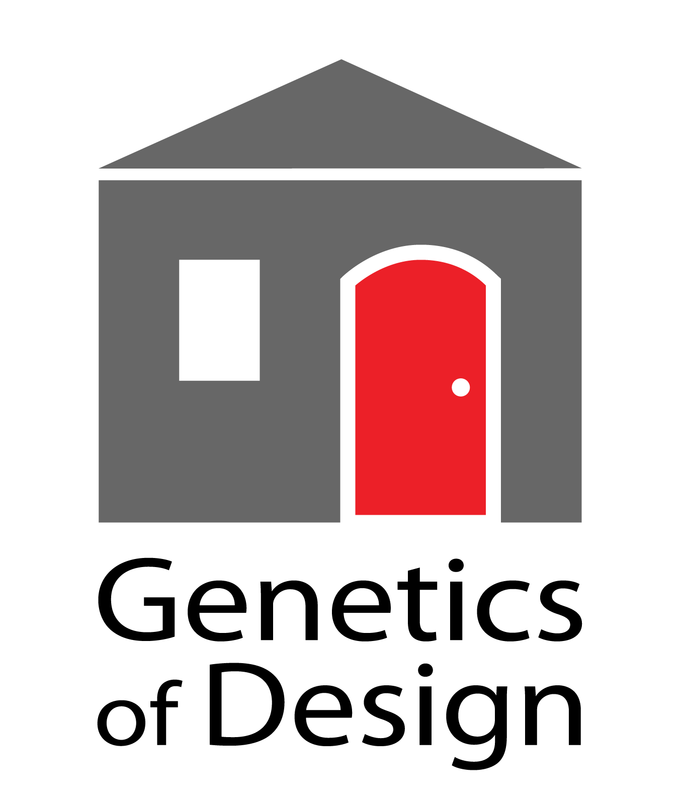 Thanks to Boston’s Institute for Human Centered Design (humancentereddesign.org) for generously providing the lab space and expert staff to help run these studies.